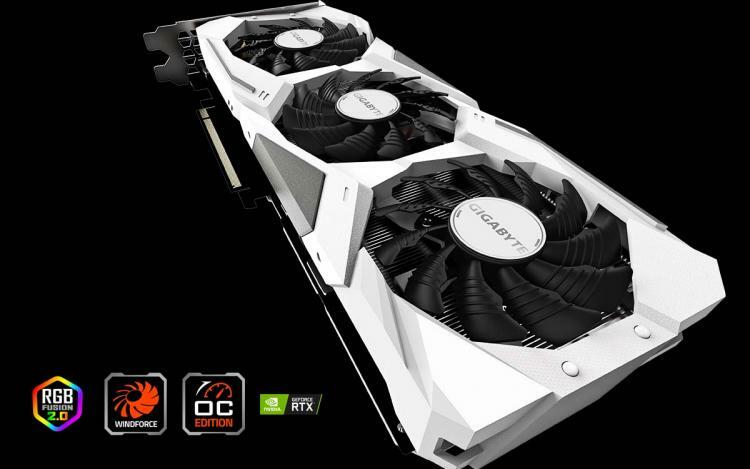 GIGABYTE adds the GeForce RTX 2070 Gaming OC White Edition graphics cards to its GeForce RTX 20 series line-up to cater the needs of enthusiasts and builders into white-coloured hardware. Like its standard counterpart, the GIGABYTE GeForce RTX 2070 Gaming OC White edition graphics card features the WINDFORCE 3X Cooling System with alternate spinning fans that produce less turbulent airflow for better heat dissipation and acoustics. It comes complete with a white metal backplate and customisable RGB lighting powered by the GIGABYTE RGB FUSION 2.0. The GIGABYTE GeForce RTX 2070 Gaming OC White Edition features the WINDFORCE 3X Cooling System with its three 80mm alternate spinning fans and 4-composite copper heat pipes with direct touch. This new cooling engine offers effective heat dissipation and better acoustics that previous cooling designs. The WINDFORCE 3X Cooling also feature the 3D Active Fan function which offers semi passive-cooling wherein the fan shutoff at low loads, a power-saving and noise-reducing feature of the cooling system. The GIGABYTE GeForce RTX 2070 Gaming OC White Edition also feature the improved GIGABYTE RGB FUSION 2.0 app for RGB lighting customisation and synchronisation. The graphics card is covered by a 4-year warranty, standard 3-year warranty, and an extended 1-year warranty by registering the product online. The GIGABYTE GeForce RTX 2070 Gaming OC White 8G is now available at partner resellers worldwide with an MSRP of $529.99 USD. Learn more about the GIGABYTE GeForce RTX 2070 Gaming OC White 8G graphics card here.